In our ongoing efforts for modernizing the way we update Dynamics 365 for Customer Engagement, we are changing the way you have access to new features and functionality. Some of the changes require explaining the groundwork of how to turn on or opt-in to those new release experiences, so that when they are released the new functionality can be leveraged quickly. Starting February 1, 2019, you can preview the features coming in the April 2019 update by opting-in to the preview feature updates in the Power platform Admin center. Opting-in will enable all the features and updates for Dynamics 365 for Customer Engagement, which becomes generally available in April 2019. More granular controls are in our roadmap and are expected to be gradually rolled out after the initial April 2019 release. The environments (instances) that are eligible for enabling the preview features of the April 2019 release are Production, Trial, and Sandbox. This will allow you the flexibility to explore the preview features, and then adopt them across your environments at a rate that suits your business. Note: We highly recommend that you create a copy of your Production environment as a Sandbox environment to try out the preview features. The Sandbox environments can be reset, backed up, and restored as you test features without impacting your Production users. By opting-in to the April 2019 preview, you can try out new platform features in Dynamics 365 for Customer Engagement and apps such as Sales, Service, and Marketing. This includes any updates to the existing functionality that will be made mandatory in April 2019 (for example, updating the form density in user experience) and features that will meaningfully change the user experience with the April 2019 update. This preview will NOT include the features and updates that will not be enabled by default in April 2019. Additional features that can be enabled on a one-by-one basis will be outlined in the April 2019 release notes, scheduled to be published on January 21, 2019. 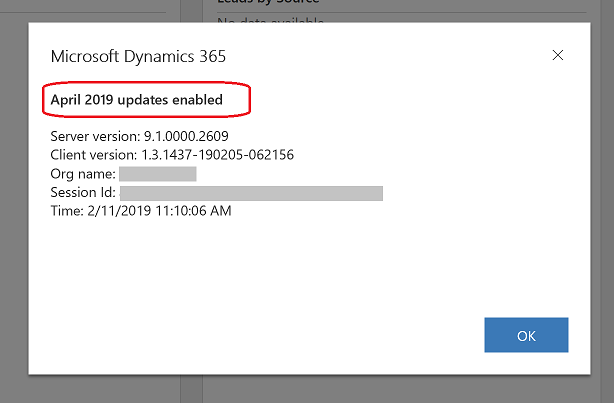 How can you identify if your environment has preview enabled for April 2019 release? Admins can go to the Power platform Admin center to view the opt-in status for their environment. Users can view the About page (as shown below) to check if April 2019 (preview) is listed with the “Version” information. How will the April 2019 features be enabled for customers who did not opt-in to the preview? Starting on April 5, 2019, we will begin to use our gradual region-by-region deployment cadence to enable the April 2019 features across our global customer base. This update will be like the Minor Service Update experience we are delivering today and won’t require you to schedule downtime to perform the update. The updates will be applied over the entire month of April. If you want to enable the April 2019 features before the update reaches your region, you can “enable” the updates yourself by opting in to the preview between February 1, 2019, and the date your region will be scheduled to have the features turned on. In coming months, we will publish the specific schedule for when the April 2019 features will be enabled for each region. Any Dynamics 365 for Customer Engagement apps installed on the environment? We recommend testing out all the scenarios exhaustively in this step.